Q. 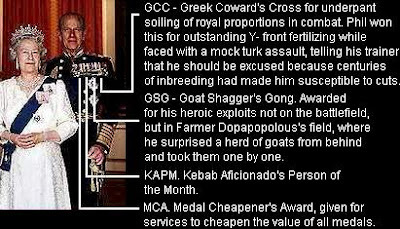 As a combat veteran who has seen terrible things in battle, lost several limbs and won a couple of medals for my troubles, I couldn't help but notice Prince Phillip's impressive batch of gongs. Could you tell me what brave deeds he performed to win so much metalwork? A. Please see the diagram above.